I had a three-day weekend this past weekend (the U.S. celebrates Labor Day the first Monday in September), and I had a long list of jam recipes I wanted to try, so I made six batches of jam, jelly, and marmalade over the weekend. Two days of relatively lightweight prep, then one thirteen-hour marathon of jam-making on Monday, wherein I cooked and bottled all six batches. My feet hurt, but I have lots of jam! 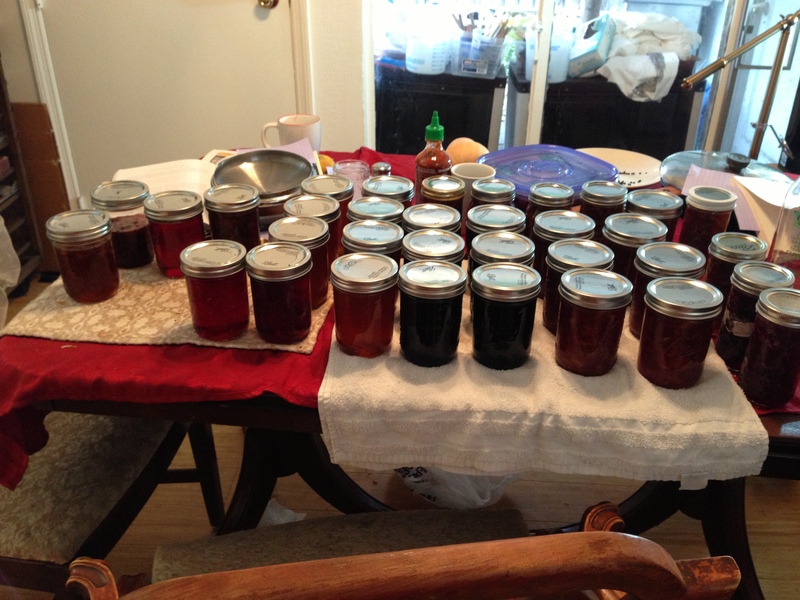 31 pints of jam, marmalade, and jelly! Of these, my favorite is the apple jelly, which has wonderfully concentrated apple flavor with a hint of spice. It’s also perfectly clear, and a deep pink, which makes it just beautiful in the jar. A pity I have so little of it! I have one nearly-full pint jar, which needs to be eaten immediately, and only two that are storable. 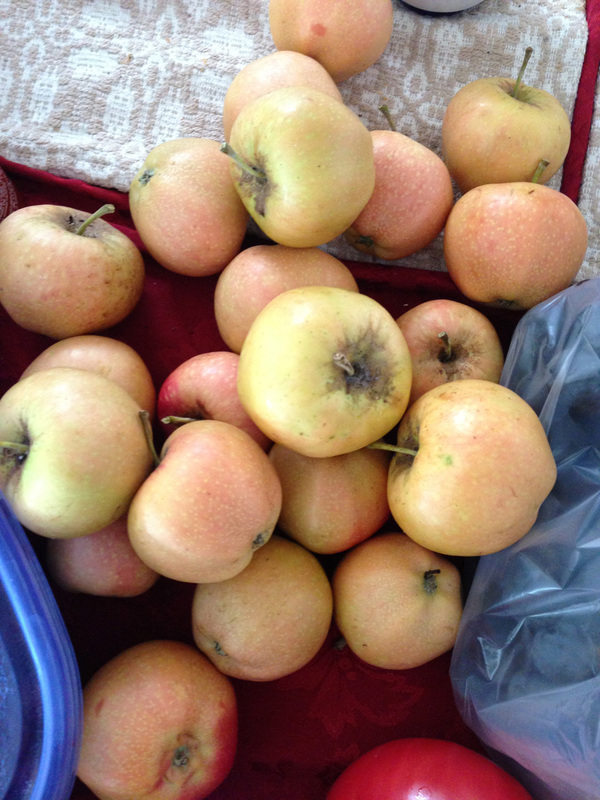 Next year I will buy more apples and make more of it! In the mid-range, the tomato orange lemon marmalade is tasty, but the lemon seems to predominate. I was hoping for more tomato flavor – it does show up, but in the background, rounding out the lemon and orange. The saffron is more in the background, but brightens the flavor. 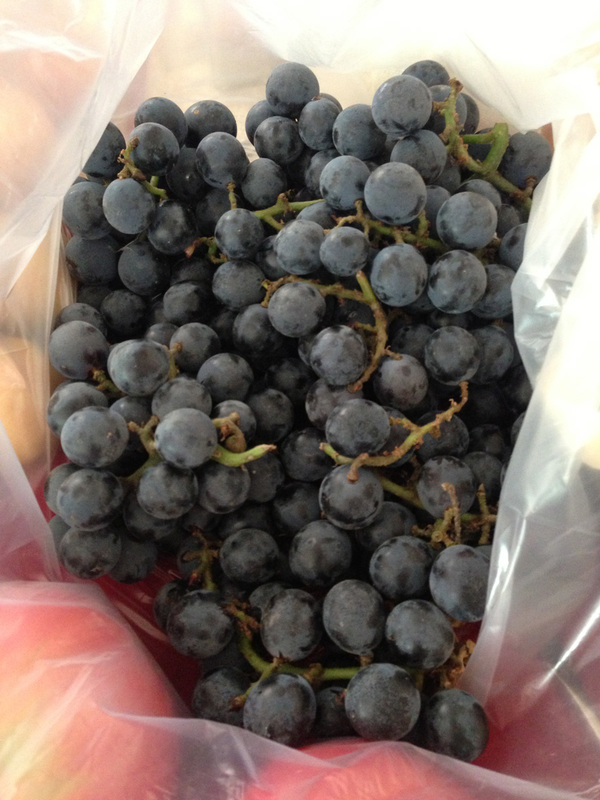 The Concord grape jam is also good, but a bit sweet for my tastes. I tasted it last night, though, and flavors shift as the jam cools, so I should really taste it again to be sure. I think the bergamot lemon lime marmalade got overcooked – it’s got a deep bitterness to it, a hint of caramel, and no identifiable lemon or lime flavor (though it does taste like citrus). Next time I will add less water to the peel when cooking it, or else boil off more water before adding the citrusy bits. I’m considering throwing this one out entirely, but I may have some coworkers who like bitter marmalades, so maybe not. What fate for these jars? Some of them I’ll keep (probably two or three of each, except the bergamot lemon lime marmalade), the rest will go to coworkers – or, if that fails, I might mail some out with the chocolates at the end of the year. Hopefully my coworkers will take the excess, and I won’t have to worry about it. What next? Well, first, cleanup. The kitchen is a disaster area (Mike has been very patient about this!). I also need to clean up from my last dye day, so tonight is probably a cleaning day. After that, I’m picking up another five pounds of bergamot tonight, so I’ll be making a big batch of candied bergamot peel, and finishing off the candied sour cherries. Finally, I finished my project for Handwoven. No photos, alas, but the items came out beautifully – if you want to know more, read the January/February 2014Â issue when it comes out! Love it, the colours look fantastic. I can only imagine the flavours as I sit here and munch on my mashed banana toast breakfast and ponder whether I should invest in a pot of jam! No…. 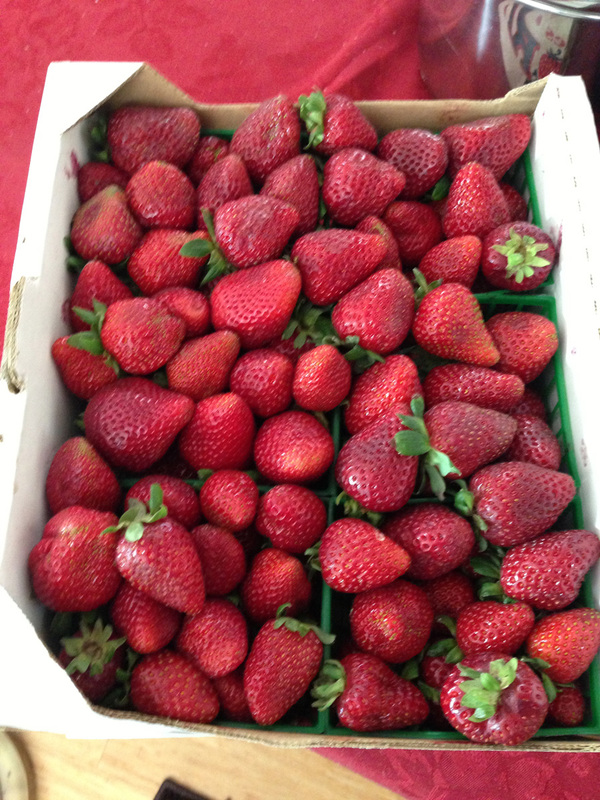 silly idea, store bought will never live up to expectations…. Enjoy Tien, look forward to reading about your next adventure in the kitchen. Those look gorgeous. 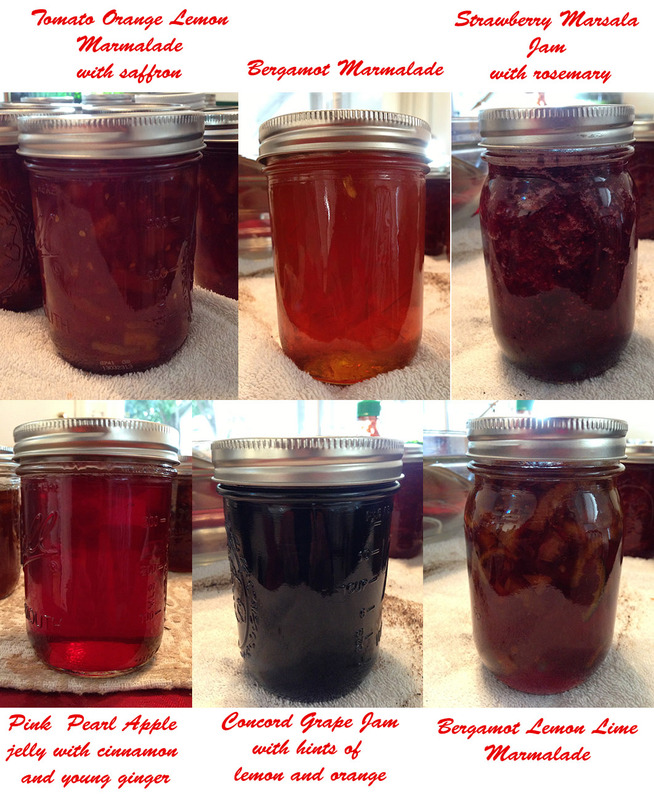 Favorite jam I ever made was a spicy apple/prickly pear jelly. It was the most beautiful clear pink, and quite tasty. ::waves hand in air:: Lover of bitter marmalade here! I keep looking & looking in all the gourmet grocery stores, but rarely find it. The best I’ve ever found was a marmalade from Germany, put up in a can, which I bought at our local wonderful German bakery. Sadly, they no longer carry it.